Posted: Thu Mar 01, 07 11:30 am Post subject: Bees! We have bees! They arrived last week - Arvo went and ferried them and all their bits over in two cars the chap we got them off and they seem to be happily doing their thing at the top of the garden. The rain not withstanding :/. Bugger. That didn't do what I expected. Excuse me while I go and RTFM. Edit again: I *heart* the link faires! Thanks . looks great. They have a lovely view! What are the ski jump thingies in front of the first two hives? It is a ramp for any who can't fly yet, who may have got disorientated during the move to be able to crawl back up again. That makes sense - although it had never occurred to me that bees would have to learn how to fly. I see you have them fenced in - are you afraid they will escape? The little ski-ramps are bits of foam that they used to shut the hives up with in the cars - they were covered in bees when they removed them, so they left them like that for them to buzz back inside . The high fencing was in-situ when we moved in - a half-assed attempt at terracing by the previous owners, combined with a long and complicated boundary dispute. However, it works in the bees favour, because if you put them about four feet away from a fence, they attain cruising height (15ft) quicker than they would otherwise and won't bump in to us as we potter around the garden. 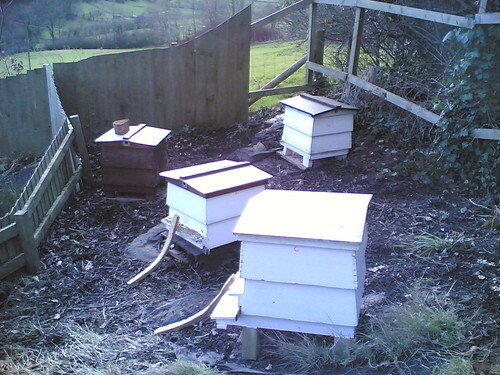 We had to put a ramp out for ours to hive them when we collected our swarm. It is also worth doing if the queen hasn't been located, and she has already finished flying. Just for 24 hours or so.